Brabant and Limburg (Southern Provinces of the Netherlands). 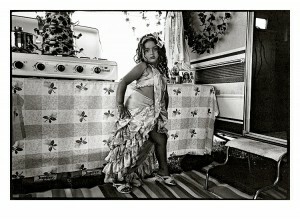 The Sinti are a Romani (gypsy) people. Traditionally traveling, today only a small percentage of the group remains unsettled. Dutch Sinti and Roma were persecuted by the Nazis during the second world war. Sinti still have a difficult position in Dutch society today. Study by the European Roma Rights Centre concludes the following, quote; ‘The issues we have presented in this contribution originate in essence from the huge cultural differences and long-standing mutual lack of acceptance that exist between the Roma and Sinti community in the Netherlands and Dutch ‘civilian society’. This has created a considerable amount of distrust between these parties, which further contributes to prejudice and leads to unequal treatment. The Roma and Sinti do not see themselves as ‘civilians’ and are usually not interested in participating in Dutch society. They differ in this way from other ethnic minority groups, because during their long history they have not aspired to ‘civilian’ careers. They are therefore less receptive to help and advice to achieve this. The high unemployment and criminality in the community does not contribute to their integration either. Moreover, the (nomadic) lifestyle of the Roma and Sinti no longer has its place in today’s post-industrial society. The social status of the Roma and Sinti is cause for concern. The considerable disadvantage they experience in participating in educa- tion and the labour market surpasses that of other minority groups in the Netherlands. There are not enough caravan encampments and sites in the country, which leads to housing problems for those Roma and Sinti who are still living as caravan dwellers. In addition, the public image of ‘Gypsies’ in Dutch society is negative and stereotypical, and the Roma and Sinti are often perceived as threatening. It is not surprising then that negative attitudes about this population group lead to suspicion and exclusion. The Dutch government has not managed to turn this tendency around, and at times exactly the opposite has occurred. This relationship between the Roma and Sinti and governmental agencies is influenced by the persecution of the community during the Second World War.’ unquote.